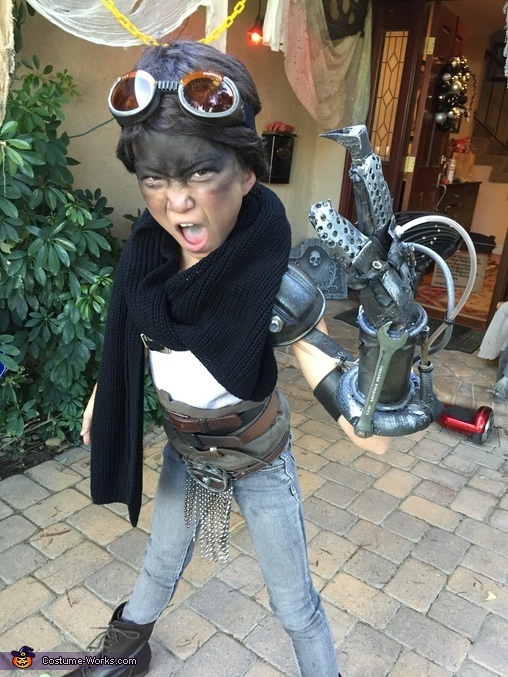 My 10 year old daughter decided to be Furiosa from Mad Max: Fury Road. We built the glove out of an old glove, gorilla tape, foam sheeting, and odds and ends from around the garage - screws, tubing, an old wrench.... Paint really brought the glove to life. We made the belt buckle out of hot glue and an old skull ring. We cut up an old purse to make the straps and backing. The rest was sourced from the local goodwill - belts, shoes, etc... We bough a short wig to cover her hair and painted her face based on internet photos from the movie. Attitude was all Jessica. LOL. Happy Halloween!